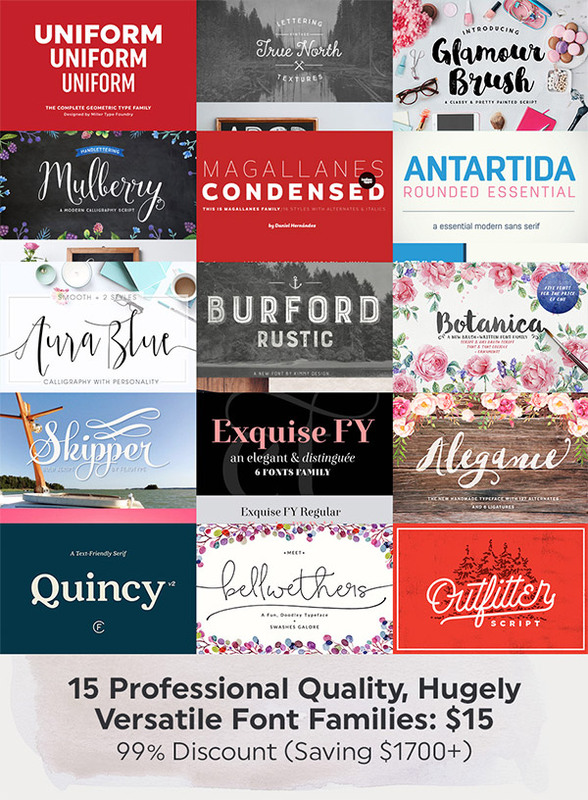 I know my readers love a good fonts bundle, so I’m excited to share the news about the latest deal from Design Cuts. 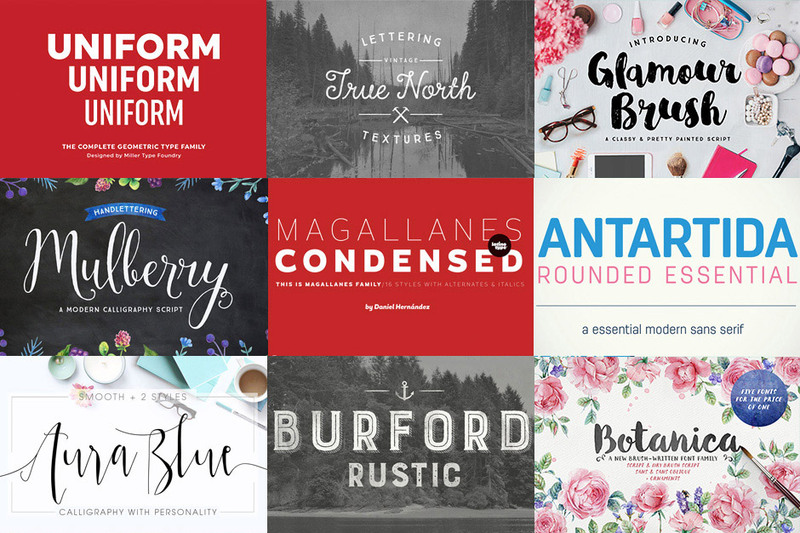 This collection of 15 professional quality, hugely versatile font families is their lowest price bundle yet at just $15 after the insane 99% discount. That’s a saving of over $1700! This bundle was made with direct feedback from the community, so it contains the best fonts designers like you and me asked for. This means there’s an awesome variety of clean/corporate fonts, artistic/brushed fonts, calligraphic/scripted fonts, and vintage/retro fonts from some of the top font foundries in the world. Uniform is a multi-width, geometric type family designed around the circle. Its three widths make an ideal type family for a host of various uses. From branding to web design, book covers to signage, Uniform is a very versatile solution to complex typographic needs. True North Textures is a headline font with alternate capitals. Combine all 18 styles with the script, banners, labels as well as extras, and you get a wonderful distressed vintage design perfect for logos or typographic illustrations. Mulberry Script is a whimsical handwritten calligraphy script with a lot of character. This typeface comes with pretty flourished alternate letters, ligatures, extras, watercolour art and ornaments. This gorgeous font also includes regular and bold weights, which is rare for this kind of hand drawn style. Quincy’s warm, flowing letterforms, tall x-height and medium contrast provide a pleasant reading experience for longer passages. Its OpenType features include ligatures, old-style figures &smp; fractions while its four weights and true italics ensure versatility. Antartida is a sans serif with rounded terminals. Its simple, neutral feeling is functional, clean & minimal, and its rounded terminals make it friendly and warm. Antartida is a family of 4 fonts comprising of 2 weights and their italics. I don’t have enough space to feature all the fonts in this bundle as part of my review, so I’d highly recommend you check out the full overview page to see the full range. Complete font families that have been meticulously designed with perfect kerning, legibility and base-lines; along with hugely extensive language support, tons of contextual/stylistic alternates, and additional characters are the most premium quality tools a designer can own. Any one of these fonts is worth more than $15 alone, so this deal is a fantastic opportunity to grab them all with a 99% discount! They really are a bunch of great folks, they also make the best bundles out there! Thank You for sharing this! I am really becoming fan of designscut now. They have excellent customer support. I really like the Glamour Script font! Will use it on my upcoming blog post images.. They resolved the recent issue of missing files in a very friendly manner. I mean if you really looking for legit and professional Graphic Files you have to try Designscut.. Awesome services Hatss off! Renewable energy is very good idea to save the world, life, money and future.